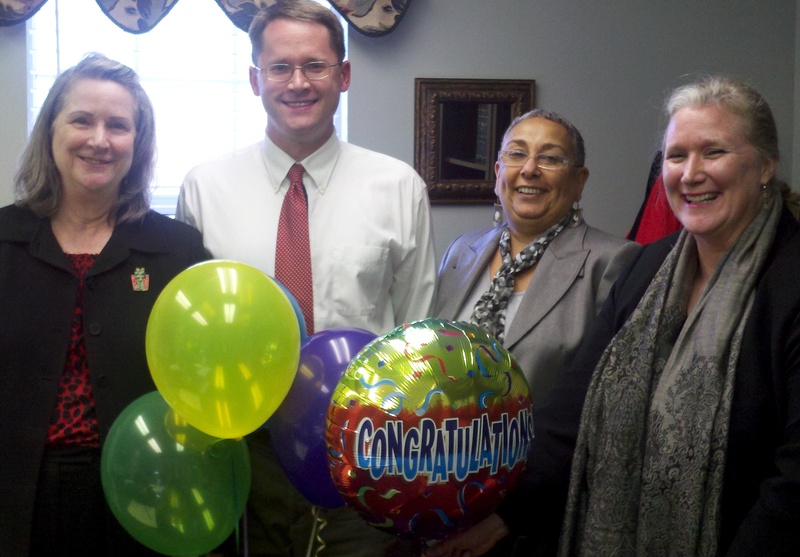 Congratulations Susan Firimonte – 2010 Ellen Hines Smith Legal Services Attorney of the Year! This morning Shannon Scruggs, Executive Director of the SC Bar Foundation, and I (Executive Director of the SC Access to Justice Commission) had the distinct privilege of announcing the 2010 Ellen Hines Smith Legal Services Attorney of the Year – Susan Firimonte. Susan was surprised as her other Florence office-mates, Andrea Loney (SCLS‘ Executive Director) and we gathered in her office to make the announcement. In support letters, Florence attorneys were impressed by Susan’s professionalism and with her legal acumen, even citing a Workers Compensation case that was heard at the Supreme Court of South Carolina. Others noted her enthusiasm and hard work to ensure delivery of legal services to the low-income community in the Pee Dee. Susan will receive the 2010 Ellen Hines Smith Legal Services Attorney of the Year Award at the South Carolina Bar Foundation’s Gala, March 3, 2011. Please join us at the Gala as we honor Susan Firimonte! P.S. Check back tomorrow for photos.